We've been talking about story telling in one of my blogger networking groups. My blog, admittedly, is not heavy on stories. I write mostly tutorials and recipes and "how to" guides in narrative formats, but rarely do I tell stories. I do, however, have some great stories to tell and I think I'd like to do more of it. On the eve of my son's fourth birthday I realized I never wrote up and shared a traditional "birth story" for him. This is kind of surprising as it's a pretty customary thing for green bloggers to do. I'd started to do it a few days after he was born but then never posted it and then days turned into weeks and weeks to months and I figured nobody would care any more. As I'm planning to write all about New Baby's birth story when he arrives in a few weeks, I wanted to share Big Brother K's story before the new little one gets here. 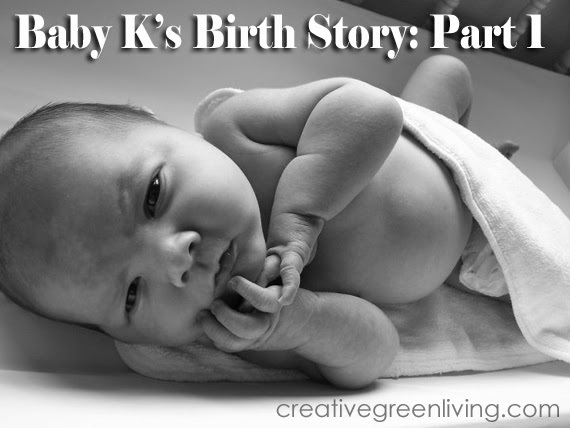 Instead of starting with the "I went into labor part" I want to back up a bit and talk about my pregnancy - because his pregnancy is a big part of why K's story is so amazing. So let's get started shall we? Some women LOVE being pregnant. I am not one of those women. Pregnancy has always been a scary, stressful time for me. We lost our first three pregnancies before seven weeks. Our fourth pregnancy made it to nine weeks but the baby, while growing, wasn't growing as fast as it should have been and was about the size of a seven week baby at 9 weeks - two days before I miscarried. As a result of all these losses, I have been poked and prodded to no end. Following the loss of our third baby, I underwent a huge battery of tests to try and figure out why an otherwise healthy 23 year old was losing babies. I remember sitting down with the phlebotomist to have my blood drawn and she started pulling out test tube after test tube to fill with my blood. She was being shadowed by an intern and his eyes got SO BIG as he saw how many tubes they were planning to fill to run all of the tests ordered. He turned to the phlebotomist and said is this the most blood you've had to drawn from one person before? Her response was no - but it was close. And the tests couldn't find anything wrong. Then we moved across the country to Portland and switched doctors. My new reproductive endocrinologist (RE) works at one of the most highly regarding fertility clinics on the west coast. After the loss of baby #4, we did more testing. Our RE said he could not find anything wrong with me or my husband and thought that for some reason our genes just didn't combine well. He thought our best chance for successfully having a baby was to undergo IVF using our own ingredients and then have the embryos tested for genetic viability at a couple days old to then only transfer the healthy embryos. This, unfortunately, was prohibitively expensive so we resigned ourselves to not having our own biological kids and started thinking about adoption. When we got pregnant for the fifth time, I was a little stressed out. First off, we had not planned it. In fact, we had planned to NOT get pregnant since pregnancy so far had inevitably led to four dead babies and I was battling depression as a result. But my period was late so I took a test. I swore I saw a faint line but wasn't sure if I was imagining it. I told my husband I thought I was pregnant again. He said he didn't think I was, that the line wasn't really there and to stop thinking about it (note to husbands: if your wife tells you she thinks she's pregnant, this is not the right answer). I wanted to make sure I wasn't seeing things, though, so I drove to my sister's house to show the test to her and she agreed there was a line. I called my RE to get my HCG and progesterone tested. The results came back and my HCG levels seemed good but was put on progesterone supplements because of borderline progesterone levels and a history of low progesterone during pregnancy. Since my previous pregnancies where characterized by low HCG levels and low progesterone, a higher HCG number was good. The real test was to see if it doubled in 48 hours. Two days later I got a call from my doctor saying that my HCG levels had more than doubled and were over 1,000. They'd never been over a few hundred before so I was tentatively hopeful everything might work out this time. 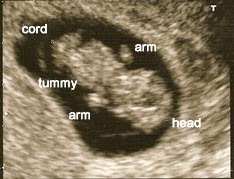 I had an ultrasound to check implantation - and there he was! I had to keep coming in every 48 hours for blood draws to monitor HCG and progesterone but was scheduled for an ultrasound at 6.5 weeks to check for a heartbeat. We went in for the ultrasound at 6.5 weeks to check for a heartbeat and I had a huge knot in my stomach - which is understandable given my history of crappy ultrasound results. The doctor found the baby but it didn't have a heartbeat. He also said it was the right size but since the heartbeat wasn't there, it just may have just stopped growing like Baby #4 did. We also reviewed my blood work and even though on I was on progesterone supplements, my progesterone levels had dropped each time they tested it which was a pretty bad sign in regard to keeping the baby. He said that the progesterone supplements were probably keeping me pregnant artificially and that I should stop taking them and consider scheduling a D&C. My husband and I didn't feel right about that so we told him we wanted to give it some more time and have another ultrasound before we stopped the progesterone. The doctor was clearly annoyed at the pregnant woman in his office who was refusing to come to terms with the fact that her baby wasn't viable but agreed to give it one more week. But then you really have to stop the progesterone he said. I realize at this point I run the risk of getting kind of cheesy. But the truth is, this is my story and this prayer meeting was a part of it. A few days after the ultrasound I described above, our church was having a large prayer gathering. Husband and I went and in addition to spending most of my time sitting alone begging God to let my baby be okay, we also asked one of our pastors to pray for us, too. He was our age and I was good friends with his wife so he was already filled in about what was going on with us. As we prayed I felt tentatively hopeful that this might really be the time that God heard us. And by "heard us", I mean that He'd give me what we were asking for. It's not that we didn't pray for the first four babies or that I think God wasn't paying attention those times. But for some reason we weren't given what we asked for the first four times we asked God to do a miracle and save our baby. Hey look, there's a baby in there! A couple days after the prayer meeting, we went back for our third ultrasound. The doctor came in the room and seemed as if he wasn't looking forward to this appointment. It definitely felt like he was just there to humor the crazy pregnant lady who insisted she wait and get another ultrasound. But then he started the ultrasound and with great surprise in his voice says Hey look, there's a baby in there! Much to his surprise, the baby was in there, he was measuring on schedule and his heartbeat was good. They also tested my HCG and progesterone levels again and my progesterone which had been dropping steadily was back up at the high end of the normal range...as if nothing had ever gone wrong in the first place. Now this might not qualify as a certifiable miracle but we sure felt like God had intervened for us in a miraculous way: the baby the expert was convinced wasn't viable and all the tests seemed to indicate was dying was alive and well!